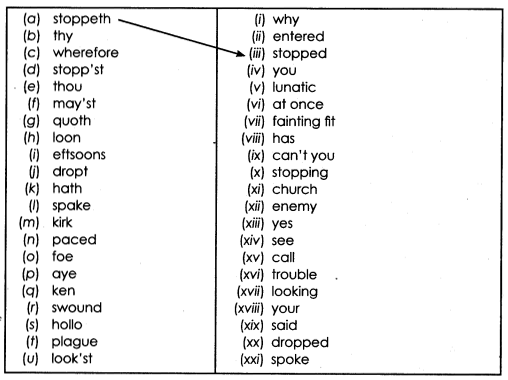 NCERT Solutions for Class 10 English Literature Chapter 11 The Rime of the Ancient Mariner are part of NCERT Solutions for Class 10 English Literature Reader. Here we have given NCERT Solutions for Class 10 English Literature Reader Chapter 11 The Rime of the Ancient Mariner. (c) Have you heard of the expression—‘having an albatross around your neck’ ? What do you think it means ? Does it mean ………………..? (iii) something that is with you all the time as a reminder that you have done something wrong ? The teacher will now assign roles and ask you to read the poem aloud to show how the poem has been written in the first person (the parts in quotation marks spoken by the Mariner) and in the third person (where the narrator comments about the events taking place). May’st hear the merry din. The man chided the mariner if he could not hear the happy sounds as he was a close relative of the bridegroom and the doors of the marriage venue were opened. He firnher added that the guests had arrived and the dinner was arranged. But the old man held him with his skinny hands and said : There was a ship………………… The man at once freed his hand from the old man’s grip and said, “stop you mad old man. leave me”. The mariner hypnotized the wedding guest with his glittering eyes and the guest could not move. He listened to the old mariner like a small child of three and the mariner had his will. Not having any other option, the wedding guest, helplessly sat on a stone and so the ancient mariner spoke continuously. Below the kirk, below the hill. The old mariner continued telling his story: We started our journey by the sea cheerfully and the ship sailed below the church, below the hill and below the lighthouse top. The sun rose everyday from the left and set on the right after shining brightly for the whole day. “Everyday the sun rose higher until it was just above our head at noon,” the old man dreamily said. By now the guest was getting impatient on hearing the sound of the bassoon, a musical instrument. The guest was too eager to go from there and was cursing himself as well as was getting irritated but he. had no other option than to listen to that ancient man who spoke continuously. Still treads the shadow of his foe. The old mariner recalled his horrible experience: “The ship’s front part dipped in the sea and the masts dropped down. The storm drove the ship southward with such force that the ship seemed to chase an enemy fiercely with a bent head. The old man narrated his tale of woe unaware of the state of the mind of the wedding guest. “It grew icy cold with mist and snow everywhere. The ship was surrounded by big, bright green pieces of floating ice. The ancient mariner said that the floating ice-bergs and their surface reflected the sunshine that made them gloomy. They could see neither man nor an animal as there was only ice surrounding the ship. The mariner recalled that they could see nothing but ice all around them. The storm howled loudly like a man in a fit and the ice also cracked making horrible noises. Amid the havoc, an albatross came emerging from the fog. The sailors thought it to be a messenger of God and called it on the ship. The albatross ate the food that it had never eaten. It became friendly with the sailors and flew in circles about the ship. Miraculously, the ice split making a thunderous noise and the helms man was able to steer the ship in the right direction. The wedding guest exclaimed that God had saved the mariner from the devils that troubled him and other sailors then why was he looking so wretched. The mariner repentandy answered that, it was he who shot the albatross with his cross bow. (a) The Ancient Mariner stopped one of the three wedding guests because ………. (iv) he wanted to stop him from going to the wedding. (iv) he had to stand next to the bridegroom during the wedding. (iv) the Wedding-Guest had the choice of not listening to the story of the Mariner. (iv) was moving towards the south. (e) The Wedding-Guest beat his breast because ……..
(ii) he was forced to listen to the Mariner’s tale when he wanted to attend the wedding ! (iv) the sound of the bassoon announced the arrival of the bride and the start of the wedding ceremony. (iv) the sailors were at its mercy. (g) The sailors felt depressed on reaching the land of mist and snow because ………. (iv) everything was grey in colour and they felt very cold. (iii) it was a messenger from God and it lifted the fog and mist. (iv) it gave them hope of survival by splitting the icebergs. (iv) the Albatross started playing with the mariners and ate the food they offered. (j) ‘It perched for vespers nine’ means ……..
(k) ‘God save thee, Ancient Mariner, / From the fiends that plague thee thus!—Why look’st thou so ? means ……..
(iv) the Ancient Mariner wanted to know whether something was troubling the Wedding-Guest. (a) How did the Ancient Mariner stop the Wedding-Guest? The ancient mariner stopped one of the three wedding guests forcefully. He wanted to tell him the adventurous story related to him. (b) Was the Wedding-Guest happy to be stopped ? Give reasons for your answer. No, the wedding guest was not happy to be stopped because he was a close relative of the bridegroom and wanted to attend the marriage ceremony in time but he was forced to hear the story of the mariner. The ancient mariner is the narrator in the poem. He is an old sailor who has a long grey beard and glittering eyes. He seems to be frighting with unnaturally skinning hands that held the wedding guest. He seems be a sociable guy before undertaking that fateful trip down to the Arctic. His life undergoes a major change as he shoots an albatross. He suffers from guilt and remorse for having killed the albatross. He repents his action and his penance continues through the rest of his life as he feels the urge to share his story with whoever he meets. The sun came up upon the left. The sailors reached the land of mist and snow because of the loud roaring blast that drove the ship faster towards the mist and snow. We know that the albatross was not afraid of the humans because it started playing with the mariners and ate the food they offered. The sailors hailed it in God’s name because it gave them hope of survival by splitting the icebergs. (i) What was the terrible deed done by the Mariner ?. Why do you think he did it? The terrible deed done by the mariner was that he shot the albatross with his cross bow. He did it to get rid of the troubles being faced, but soon he realised his mistake to find more troubles after the death of albatross. There are a number of literary devices used in the poem. Some of them have been listed below. Choose the right ones and write them down in the table as shown in the example. In each of the cases explain what they mean. The ship started moving in the northern direction. We can say this because the poet says the sun rose in the right and he also says the south wind blew behind the ship. He says so because the mariner had killed the albatross. It no more followed the ship for food or for playing with the mariners. At first all the mariners said that the ancient mariner had done a wrong thing by killing the bird. Then, when the weather improved, they all said that he had done the right thing by killing the bird. Finally when the ship stopped moving they said he had committed a crime by killing the bird. They changed their mind three times. This shows that they did not have an opinion of their own or a mind of their own. After the ship left the land of mist and snow, it entered an area where the weather was very hot. Then the ship moved into the sea where the breeze was blowing fine. From here the ship moved into a region where the weather was very hot and it was still all around. There was no breeze at all so the ship could just not move. (e) What is indicated by the line ‘The bloody sun, at noon,/Right up above the mast did stand,/No bigger than the moon’? This line states that the sun was shining very bright and it was right above the ship. It was very hot but the size of the sun was not very big. The poet compares it to the size of the moon. The mariner says that there was no air and no movement. He compares their ship to a painted ship which stands still on a painted ocean. The ship is stuck in the middle of the sea with water all around. The weather is extremely hot and mariners need drinking water. In spite of there being water, there was not a drop of c drinking water available. That is the irony in this stanza. Through the tenth and eleventh stanza, the poet brings out the condition of the creatures in the sea. As there was no breeze blowing, the creatures had started dying. At night it appeared as though death was dancing at the gate of the ship. The condition of the sailors was pathetic. The mariners felt that the ancient mariner was responsible for their suffering. He had killed an innocent bird, the albatross, without any provocation. The sailors were feeling very thirsty as there was no drinking water available. Their throats were dry and they could not speak even a word. 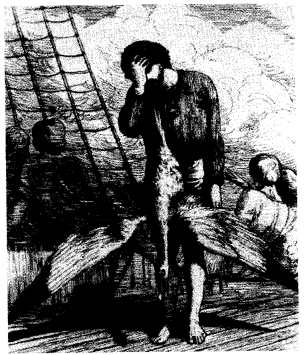 The mariners hung the albatross around the neck of the Ancient Mariner in order to remind him of the ghasdy deed he had committed by killing the innocent bird. 1. out of the sea come he, Personification: The sun has been compared to a human being capable of movement. 2. And it would work’em woe. Alliteration: The letter’ w’ has been repeated thrice. 3. Nor dim nor red, like God’s own head, Simile: Sun has been compared to God’s glorious head. 4. The fair breeze blew, the white foam flew The furrow followed free Alliteration: The letter ‘f has been repeated and blew and flew has repetition of ew sound. 5. And we did speak only to break the silence of the sea! Hyperbole: The speakers have exaggerated their action of speaking. 6. All in a hot and copper sky the bloody sun at noon Metaphor: Sky and the sun have been indirectly compared to copper and blood respectively. 7. As idle as a painted ship Simile: The ship has been compared to a painting. 8. Day after day, day after Say Repetition: The words have been repeated. 9. Water, water every where not any drop to drink. Irony: Though there is lot of water but the sailors could not drink even a single drop. 10. The death-fires danced at night. Personification: Fire has been shown as doing a dance of death. What is the rhyme scheme of the poem ? ………………………………….. Coleridge uses onomatopoeic words which use harsh ‘ck’ sounds to make the ice sound brutal. He also gives the ice animal sounds to give the impression it has come alive and is attacking the ship. 2. breeze blew ____________ alliteration ___________ alliteration is used to give a reinforcement to the sound. 5. hot and copper sky _________ metaphor, visual imagery ________ The elements in a literary work used to evoke mental images, not only of the visual sense, but of sensation and emotion as well. Sky looks like a hot piece of copper. 6. bloody sun _____________ visual and sensational imagery. 7. Day after day, day after day ________ repetition __________ the poet uses this technique for emphasis. 8. Water, water everywhere _____________ repetition _____________ for emphasis. 9. like a witch’s oil ______________ simile ____________used to bring out a comparison. Supernatural elements make the poem interesting and there are surprises and surprises for the readers. The poet could have said this very incident in a simple manner. Use of these supernatural elements such as the ‘albatross being a sign of good omen, ‘the ocean appearing to rot’, ‘the death fires dancing’ etc keeps the suspense and thrill alive, besides creating a lot of visual imagery. Every ship is supposed to have a log book, which is filled in every day by the captain. If he dies, the next senior officer fills it in (usually the First Mate). Decide on appropriate dates (the mariner’s tale was supposed to be thought of as already very old when the poem was published : it should be no later than about 1700 AD; other clues to the date are the light-house and the mariner’s crossbow). If you wish you can make the log look old by staining the pages, by your handwriting and spelling. Write a series of entriesfor the log for the important events that take place in the ship as recorded in the poem. The first one has been done as an example. Today we left the shore at 3.30 p.m. under glorious sailing conditions. We have 230 men on board. We are sailing with cargo towards Portugal. The journey is expected to take 90 days. We are well stocked with food and water to last us 250 days in case of any emergency. Hopefully we will not face any untoward i happenings. God be with us ! Student to role-play the situations in groups. (i) Why did the Ancient Mariner stop the particular Wedding-Guest to listen to his tale? (ii) Why did he have to tell his tale to someone? (iii) What is the poet trying to convey through this poem? (i) The ancient mariner was feeling himself burdened with the crime of killing the albatross. Other mariners also felt that the ancient mariner was responsible for their suffering. They hung the albatross around the ancient mariner’s neck as a reminder of his sin. Now in order to lighten his burden, he stopped the wedding guest to narrate to him his tale of woe. (ii) The Ancient Mariner stopped a man on his way to a wedding function to narrate his experience at the sea. Though there was no particular reason for the Ancient Mariner to stop the wedding guest, yet there seemed a kind of moral suggestion to love all men and birds equally. He did not want others to meet the same fate as he had. (iii) The Rime of the Ancient Mariner is a balled. Through this poem, Coleridge conveys a message to get close to God through prayer. The Ancient Mariner committed a sin that was rebuked by all. The Ancient Mariner relieved himself of his psychological burden by telling his tale to the wedding guest. The poet associates himself with Ancient Mariner to tell this allegorical poem in order to convey a powerful message to respect all the creatures of the world. We hope the NCERT Solutions for Class 10 English Literature Chapter 11 The Rime of the Ancient Mariner help you. If you have any query regarding NCERT Solutions for Class 10 English Literature Reader Chapter 11 The Rime of the Ancient Mariner, Nor the Gilded Monuments, drop a comment below and we will get back to you at the earliest.